Hello, and thank you for visiting the Oliver website. We appreciate you considering our team to keep your family safe and comfortable. 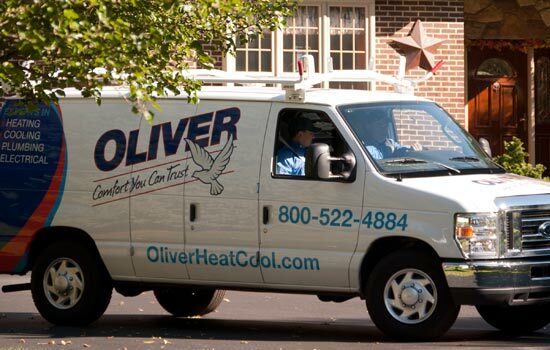 Oliver specializes in Heating, Cooling, Plumbing, and Electrical services. We feel it is our job to educate you about your home’s mechanical systems, and we have put together a guide to inform you about the products and services we provide. Many of the accessories we offer lower your operating costs, increase your comfort and keep your family and property safe. If you have any questions or concerns, or would like more details about the products and services you see in the guide, please give us a call or schedule your appointment online! HVAC Maintenance Plans from Oliver give you Peace of Mind. Our trained and friendly professionals offer heating installation, repair, and maintenance to help you keep your home warm all winter long. We use the latest tools and products to install your new air conditioning unit, repair your current one, and help you stay up-to-date on maintenance. Our expert plumbing staff can quickly and thoroughly handle all of your plumbing needs, from leaky faucets to toilet repairs, and more. Whether you’re in need of electrical repair or you want to replace your current electrical system, our staff members can get you back on track. Our duct cleaning services can get rid of mold, bacteria, dust, dirt, fungi, and many other contaminants that can harm your health. Whether your hot water heater needs to be repaired or replaced, our trained technicians can get the job done quickly and thoroughly. Our home energy audit service, performed by our professionals, can help you diagnose and solve your indoor air quality and comfort problems. Whether you’re looking to update your bathroom or your kitchen, we offer a wide range of services that can give your home a fresh new look. Oliver also offers other services, including duct cleaning, geothermal and solar HVAC options, and more.